Steele, Numerical Computation of Electric and Magnetic Fields, 2nd ed. 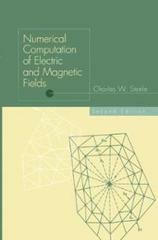 Numerical Computation of Electric and Magnetic Fields, 2nd ed. Is the Problem Static, Quasi-Static, or Dynamic? What Field Is To Be Computed? Is the Problem Two-Dimensional or Three-Dimensional?